FOOZ FIGHTERS are the #1 Tribute Band to Foo Fighters delivering all the sound, look and raw energy of a live concert performance by the Grammy Award winning band. Lead singer Nicky Rich not only strongly resembles legendary Foo Fighters frontman Dave Grohl right down to the feather tattoos on his forearms, but consistently delivers the bombastic over the top vocal and stage performance fans have come to expect. 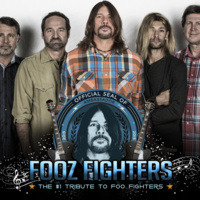 Since forming in 2014, FOOZ FIGHTERS have quickly become one of the nation’s top tribute bands playing to packed crowds at concert halls, festivals and casino's including their recent East Coast Tour with shows at Golden Nugget in Atlantic City, NJ and Long Island, NY. In 2017, FOOZ FIGHTERS played their first international show at Black Box Tijuana as well as traveled to El Paso, Texas for a headlining show at Speaking Rock Casino. Seeing FOOZ FIGHTERS live is about as close as you will get to the real thing. Rock & Brews San Manuel Casino (which happens to be owned by Gene Simmons and Paul Stanley of Kiss) recently wrote "Fooz Fighters are so similar to the actual band, you'll be convinced you're watching Dave Grohl and Company!". New Jersey's #1 Rock Station 100.7 WZXL says "Nicky Rich is dead-on for Dave Grohl, look, moves, energy and sound".